Charity Cupcake Challenge 2012 - Best Frosting Again! Treasure Coast Confections was at the Jeanne Graves Charity Cupcake Challenge and for the 2nd year in a row took home the "Best Frosting" in the Professional Division. Competition was tough, there were some amazing entries this year. But, the best part.... raising money for the Michael J Fox Foundation for Parkinsons Research. Photo: 12 Spiced Caramel Apple Cupcakes topped with chocolate bark and edible fall leaves. and her party guests called me after dessert was over, just to tell me how much they loved it. And because of you, I'm a little more happy! Made me feel like I was floating! I'd better eat the second, before it gets sour!! These were for my husbands birthday. He loves them! I will be ordering these again. Very very good! "It was amazing!!!!!!! 5 stars "
Plain cheesecake, topped with sweet mascarpone cream. Raspberry Honey Sauce on the side, for those who like berries with their cheesecake. Dana B., Pt St Lucie ~ This was delish! Lisa B., Jensen Beach ~ This was awesome ! Linda B., West Palm Beach ~ So good! A fantastic way to show the Mothers of the church body that they are appreciated. I love to support our local community. This fantastic fundraiser event provided great food and a varied shopping experience for their guests with all proceeds benefiting the JBHS band. It was such a pleasure getting to meet the parents, family and JBHS faculty in attendance as well as other local business owners. It was a great pleasure to be included in the Martin County Junior League's event, LunaFest this year. TCC had an offering of prepackaged sweets and treats available and the reviews have been great. Gourmet popcorn, chocolate pretzel rods, pistachio cranberry bark, biscotti, chocolate lady fingers, chocolate covered coconut cookies, truffles, s'more pops, and cupcakes inspired by some of the favorite "girls night out" cocktails... the event was a great success! Triple Treat Towers are Terrific! Corporate Gift Giving and Customer Appreciation is Made Easy at TCC! 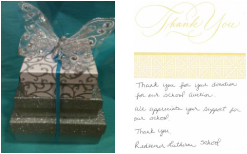 "Dropped off one of the larger packages today and she loved it! Thank you so much for an amazing job and incredible talent! You're awesome!" Before this tower of treats even made it to the tower the volunteers were already talking about bidding on it in the auction. Wedding Cakes and Served Full Sized Desserts are not the only options available to brides anymore. Consider a cupcake tower in lieu of a wedding cake, a dessert bar of varied options at the reception, or for evening weddings butlers with bite sized desserts for your guests prior to the wedding, during the cocktail hour or even throughout the reception. Additionally, sweet treats are a welcomed wedding favor that your guests can enjoy at home in memory of your special day. Treasure Coast Confections Takes Home the Win! Sunday, October 3, 2011... Treasure Coast Confections participated in a Charity Cupcake Challenge to support the Michael J Fox Foundation and Parkinson's Research. In the Professional Division, Treasure Coast Confections took home the win in three categories. The winning flavor was the NEW... White Chocolate Cinnamon Streusel Cupcake with Caramel Ganache and White Chocolate Frosting. Click the Photo to view the Vero News article on the event. Jenny B in Jensen: very yummy! I of course snuck home a few for later! This is the 5th confession I have actually received in print! Thanks for the chocolate covered pretzels...they were a hit...everyone loved the 3 different choices! Big hit! I LOVED the coffee cupcakes. The cupcakes were fabulous!! everyone loved them! Thanks so much for everything! 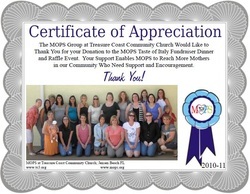 the MOPS group at Treasure Coast Community Church (tc3.org) . This box was raffled off to raise money to for the MOPS group at their "Taste of Italy" Dinner and Raffle Event. MOPS at TC3 is reaching, encouraging, supporting and equipping mothers and families in our community. Creative Cupcakes is a proud supporter of MOPS at TC3. Your deserts were fantastic! I didn't even put out the oreo balls or the nutter flutter pies because I ate them all myself! OMG they were amazing. The Oreo Truffles are amazing! You cannot eat just one! My sister brought some to our family reunion and they were the hit of the dessert table. It began with a simple fundraiser event. I brought the new fan favorite "Blueberry French Toast Cupcakes" and debuted the new "Triple Chocolate Espresso Truffles". "Mini Blueberry French Toast Cupcakes were to die for. YUMMY"
"No, the Triple Chocolate Espresso Truffles were to die for!" Simmer down ladies, simmer down. Your cupcakes are absolutely fantastic!! I can't wait to try more. Jennifer L. had the opportunity to sample the "Blueberry French Toast" Mini Cupcake at the MOPS "Taste of Italy" Fundraiser Event at Treasure Coast Community Church. If you haven't tried Gena's Blueberry French Toast Cupcakes than you are missing out. They are unbelievably good and so beautiful to look at. My favorite by far.Jessica Z.
Jessica Z. has had several run ins with the "Blueberry French Toast" Cupcake. As well as, many other tasty treats. Your cupcakes take me to another place. Shannon H. sampled the "S'mores" Cupcake at a MOPS Leader Meeting at Treasure Coast Community Church.